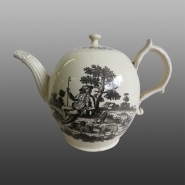 Creamware, printed on one side with The Haymakers, signed "T.Rothwell Delin[eavit] et Sculp[sit]", meaning that Rothwell both drew and engraved the design. In fact this design had probably begun its ceramic life on Worcester porcelain: it is item 51 in Cyril Cook's Life and Work of Robert Hancock (1948). Thomas Rothwell (1740-1807) was born and married in Liverpool, and his children were baptised there in 1761-62. According to Simeon Shaw's History of the Staffordshire Potteries (1829), he went to work for Humphrey Palmer at Hanley, Staffordshire as engraver and printer about 1767. 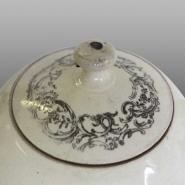 Before then he was probably a freelance engraver and printer in Liverpool, where this pot may have been printed. Its form with a vertical footring suggests an early date. The pot itself may have been made in Staffordshire or Liverpool. The other side is printed with The Shepherd, another design which probably began its ceramic life on Worcester porcelain: it is item 159 in Cyril Cook's Supplement to the Life and Work of Robert Hancock (1955).